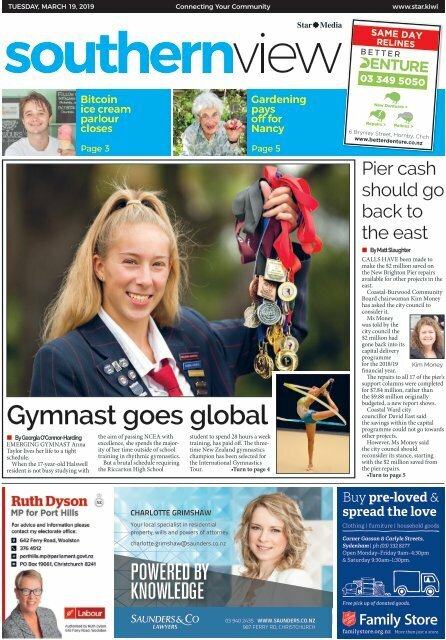 TUESDAY, MARCH 19, 2019 Connecting Your Community www.star.kiwi SAME DAY RELINES 03 349 5050 Bitcoin ice cream parlour closes Page 3 Page 5 Gymnast goes global • By Georgia O’Connor-Harding EMERGING GYMNAST Anna Taylor lives her life to a tight schedule. When the 17-year-old Halswell resident is not busy studying with the aim of passing NCEA with excellence, she spends the majority of her time outside of school training in rhythmic gymnastics. But a brutal schedule requiring the Riccarton High School student to spend 28 hours a week training, has paid off. The threetime New Zealand gymnastics champion has been selected for the International Gymnastics Tour. •Turn to page 4 Gardening pays off for Nancy New Dentures > Repairs > Relines > 6 Brynley Street, Hornby, Chch www.betterdenture.co.nz Pier cash should go back to the east • By Matt Slaughter CALLS HAVE been made to make the $2 million saved on the New Brighton Pier repairs available for other projects in the east. Coastal-Burwood Community Board chairwoman Kim Money has asked the city council to consider it. Ms Money was told by the city council the $2 million had gone back into its capital delivery programme for the 2018/19 financial year. Kim Money The repairs to all 17 of the pier’s support columns were completed for $7.84 million, rather than the $9.88 million originally budgeted, a new report shows. Coastal Ward city councillor David East said the savings within the capital programme could not go towards other projects. However, Ms Money said the city council should reconsider its stance, starting with the $2 million saved from the pier repairs. •Turn to page 5 Buy pre-loved & spread the love Clothing | furniture | household goods Corner Gasson & Carlyle Streets, Sydenham | ph (03) 332 8277 Open Monday–Friday 9am–4:30pm & Saturday 9:30am–1:30pm. Free pick up of donated goods. familystore.org.nz More than just a store.